We appreciate all of the phone calls, and we thank you for your patience while we have been finalizing our plans for the next football season. Last spring we were approached by a group wanting to partner with the HSFL, thus allowing us to take our organization to a new level. After much consideration and due diligence, we are moving forward with our venture which will create a substantial project for the HSFL facility. We told many of you that we would get back to you as soon as possible once we knew which direction this venture would take the league. We are very excited about our future plans, but in order to fully devote the time needed to undertake such a project, we will not conduct league wide events this spring season. We will keep all of you posted on our future plans as they unfold. Thank you for all you do to have a positive impact on the young men in our community, and we look forward to seeing you very soon. Congratulations to the seniors from the Class of 2014 that were inducted into the HSFL Hall of Fame!! Click HERE for details! It was a very memorable State Championship weekend and the level of talent on display was tremendous!! Congratulations to our 2014 HSFL Most Valuable Players!! Congratulations to the 2014 City Champions, the Houston Outlaws, at BOTH the JV and Varsity levels!! Congratulations to HSFL Alumni Armanti Foreman (Texas commit) and Zach Whitley (UCLA commit) for being selected as the Touchdown Club of Houston Offensive and Defensive Player of the year!! Zach has also been chosen as a finalist for the National "Chip Off The Old Block" Award!! What an incredible State Championship Weekend! That was some of the best 7th and 8th grade football one will ever see!! Thank you to the staff of Baylor University for another incredible day of football! The HSFL College Experience at UH was the best yet! We had more players than we have ever had and they heard some life changing messages. They learned what it really takes to play major college football and more importantly they learned how their off field performance is even more critical! A special thank you to Coach Levine and his entire staff for hosting the young men of the HSFL!! 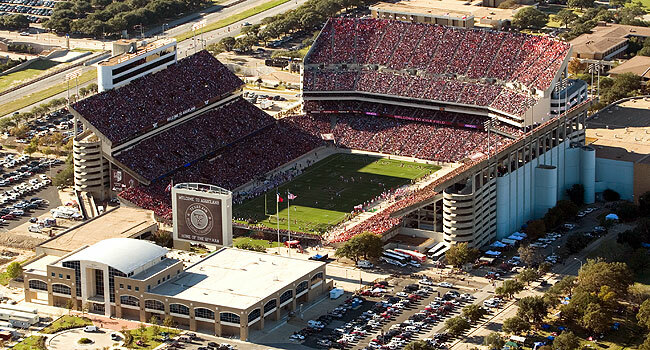 at Kyle Field at Texas A&M University!! 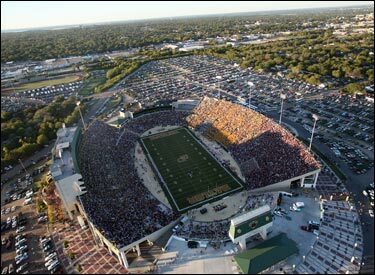 2013 Eastbay FBU All- American Games this year in San Antonio!! and showed tremendous performance on the field. 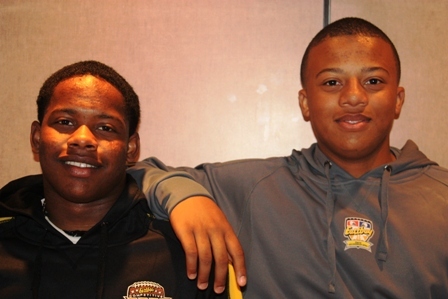 We are so proud of our HSFL Alumni who participated in the Eastbay FBU All-American Games in San Antonio!! Greg Linton, Shola Ayinde and Charles Chapman represented our league with class and dignity, as well as strong performances on the field. Congratulations to Michael Dunn, Joel Pineda and Cameron Townsend for being chosen to play in the All-American Game in the Alamodome in San Antonio in January!! These young men were selected from thousands of nominations from around the countryto represent all 8th grade football players located west of the Mississippi River! It is a tremendous honor for the HSFL to have three players chosen to represent our league and it is a testament to the talent and character of the young men that elect to compete in the HSFL. Each of the young men conducted themselves with class and dignity both on and off the field. They represent precisely the character that we strive to demonstrate in our organization. Each of these young men are hard workers, very coachable and take care of their business in the classroom! The HSFL was also very well represented in the FBU National Youth Combine, held the same weekend. 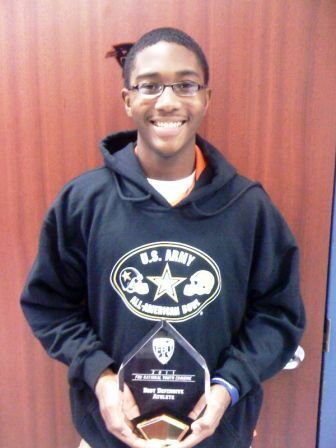 Robert Woodard was awarded the best 8th grade defensive player award for his efforts in the combine! Well done men, we are VERY proud of you!! Congratulations to Tony Combs and Christopher Zook for being chosen to play in the All-American Game on January 10th in the Alamodome in San Antonio!! These young men were selected from thousands of nominations from around the country to be 2 of the 22 players on the West team representing all 8th grade football players located west of the Mississippi River! 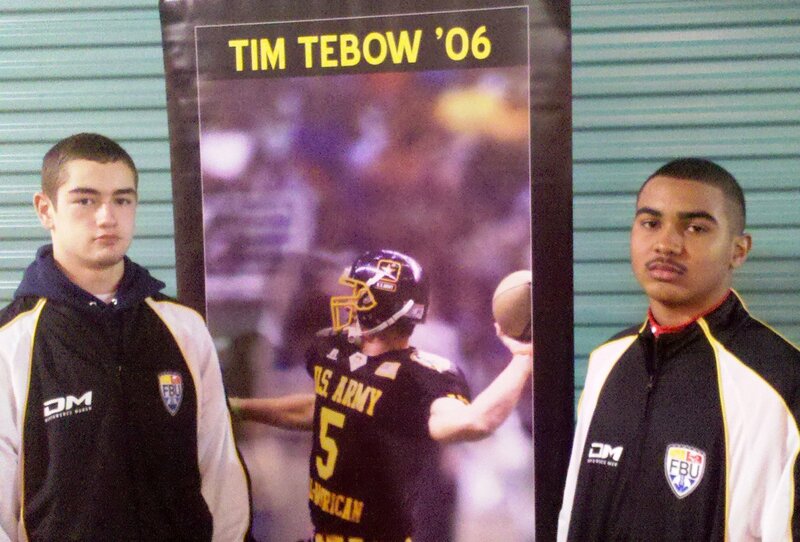 Even more impressive is the fact that both of these young men played in the game as 7th graders. Only 7 of the 44 players from last year’s game were asked to come back as 8th graders! It is a wonderful honor for the HSFL to have two players chosen to represent our league and it is a testament to the talent and character of the young men that elect to compete in the HSFL. Both of these young men conducted themselves with class and dignity both on and off the field. They represent precisely the character that we strive to demonstrate in our organization. Both players performed admirably on the field and we are ecstatic to announce that Tony Combs was awarded the Most Valuable Player award for the West team!! HSFL PLAYERS SELECTED FOR ALL-AMERICAN GAME! 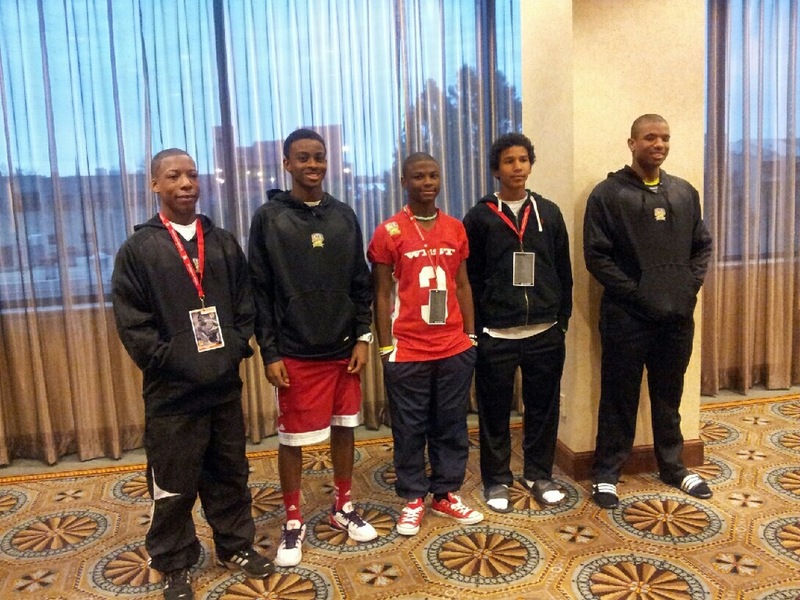 5 members of the West Team at the US Army 7th grade All-American Bowl were from the HSFL. The game was played January 4th at the Alamodome in San Antonio. CONGRATULATIONS TO DON HENDERSON, CHRISTOPHER ZOOK, TONY COMBS, LEWIS ALLEN AND EDDIE GOODMAN. WE ARE PROUD OF EACH OF YOU! See the news regarding the Football University/US Army All-American 7th grade game in our Press Room by clicking HERE! Follow the HSFL on Twitter! Watch the coverage of the 2010 State Championship! Watch the Ch. 13 coverage of the 2010 City Championship! Watch the Ch. 39 News Story!